Online registration Bihar combined competitive entrance examination Board receive an application for admission in paramedical & paramedical dentist course. The student who wishes to take admission in such courses from an institute in Bihar state here is every detail about how to apply online for entrance exam & BCECE PM/PMD Counseling process. Bihar Combined Entrance Competitive Examination Board (BCECEB) for admission in various professional courses in different Medical colleges under the Govt.of Bihar is being conducted by Bihar Combined Entrance Competitive Examination Board as constituted under the BCECE Board Act, 1995. Get every required information about paramedical dentist course & paramedical course. 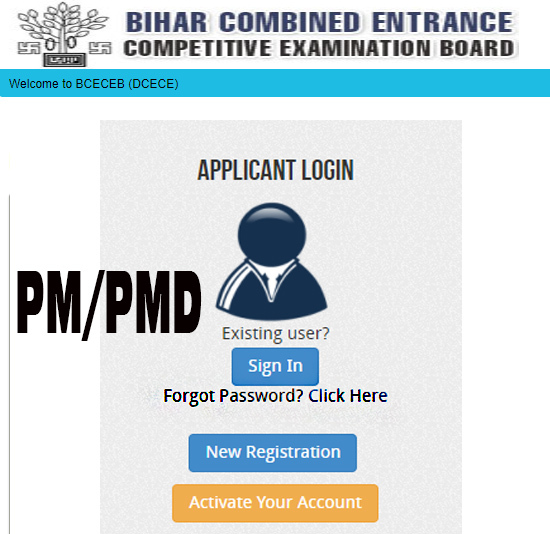 Students before applying in Bihar paramedical or Bihar paramedical dentist course need to know about bceceb PM/ PMD Online registration process, Eligibility of admission, an important event of entrance exam, exam date & admit card admit and admission process. Aspirants who want to apply online for registration for admission/ counselling in Bihar paramedical entrance exam had to fulfil eligibility category. Eligibility categorical has been described below for Bihar paramedical eligibility category as might be different as per course Choose by students. They must have qualified the academic education from a recognized board or equivalent. PMD: The qualifying examination must be passed in subjects like Physics, Chemistry, Biology and English. Age Limit: The minimum age 15 years as on 31st December 2019 and maximum age limit are 30 years. PM: Diploma in Pharmacy is 12th with physics, chemistry, English, maths/biology subjects. Candidates applying for GNM course are required to pass the 12th exam in physics, chemistry and biology subjects. Age Limit:17 years as on 31st December 2019 to 32 years. Aspirants who are going to apply DCECE PM or DECE PMD Online they have required to pay the online application fee using their debit/ credit card or net banking facility. Fee for one program or fee for both program apply has differed. Aspirants have to go through the given event date for admission in Bihar paramedical or paramedical dentist course. Candidate can apply for the diploma in paramedical or dentist course admission online registration. It can be registered online mode only there is no facility to submit an offline application form. Before going to fill the application form as you must read official notification and instruction to filling online application about how to fill online Bihar diploma paramedical dentist entrance exam admission application forms. Things which they require by filling of online application form has been described below. Who participate in entrance examination required to download of bceceb pm or pmd Exam Admit Card. It can be download from the official website of Bihar combined competitive entrance examination @ bceceboard.bihar.gov.in official website using registration number and password which got while registration time. The process to download of admit card of Bihar paramedical entrance exam has been given below. Enter registration details to download Admit Card. Bihar BCECE diploma in paramedical result qualify is compulsory to get admission to in Bihar PM or PMD result have to follow the instruction which has been described below. To check result aspirants require user roll number and date of birth. the result will appear on the new screen print out for use. For admission BCECE on official website release pm PM or Paramedical Dentist counselling merit list, Aspirants have to download the merit list of paramedical and paramedical dentist course and go through the instruction which has been given, after finding roll number in BCECE paramedical counselling merit list 2019. It observed that family who belong to the middle class from the state of Bihar. Para Medical and paramedical dentist course are prepared by the students’ passion to make their career in the medical sector. This course helps such a student to study Medical related courses this help them to become the nurse. This course is mostly preferred by girls in Bihar State. Willing to say something about Bihar paramedical course or having any query about it then please proceed it through comment.